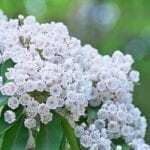 Native mountain laurel where we live (central PA) is in the midst of blooming right now. I would like to purchase some shrubs and use them to landscape our new home in the woods. Is it too late to do this this year? Is fall a better time for planting (even though our winter was exceptionally cold last year)? Would they do best if I wait for spring and plant before they bloom? You should be able to purchase plants at a local nursery and you could plant now or wait until fall.